pis may be our only real challenger to the throne of world’s most interesting genus. We all know bees can only sting once and then they die, that tessellated hexagons are the most mathematically efficient way of organizing cells of a honeycomb, and that a hive of bees will collectively fly 50,000 miles to 2,000,000 flowers to make one pound of honey (right?). 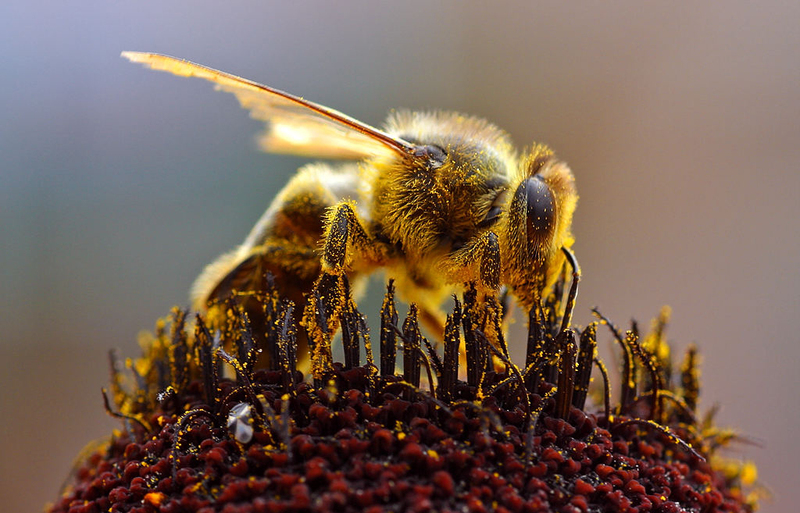 But here are some facts about bees — or “statements,” if you prefer, as some of them are controversial — you may not know. 1. Honey is the only food that never spoils. 2. Bees communicate through movement. 3. Bees can think in 6 dimensions. 4. The lifespan of a bee, like that of a car, is determined not by age but by distance. 5. Bees communicate through smell. 6. Male bees have half a set of chromosomes. 7. Bees can clone themselves. 8. Drop for drop, bee toxin is more deadly than rattlesnake venom. 9. Bees can relieve symptoms of arthritis and multiple sclerosis, detect cancer and kill HIV. 10. Bees are better at math than you are. There’s some dispute over the claim that honey never spoils, of course; notwithstanding the popular rumour that still-edible honey was unearthed from a 2000-year-old Egyptian tomb, honey will, in fact, moulder if exposed to too much moisture, or dry out (eventually) if the reverse is true. And this not to mention salt, which never spoils — but perhaps we could fight pedantry with pedantry by insisting that salt is a condiment, not a food. What nobody would dispute is that carefully preserved honey remains edible and nutritive for a very, very long time. As with so many of life’s interest things, the really interesting bits about bee communication are in the details. The information bees are expressing using movement, or the “waggle dance” as it’s technically known, relates directions to food sources. They move in a figure 8 pattern, in the dark, usually along a vertical surface crowded with other honeybees. Imagine trying to get directions to the subway 10 blocks away from a stranger in a pitch-black, crowded bar simply by feeling them jostle past you as they push through the crowd, and you start to get an idea how incredible that is. It begs the question: how do they pack so much information into a relatively simply motion? “Bees can smell fear,” you say? Well … perhaps not. But there’s evidence that odor is tied to the way they communicate about food sources. And there’s no disputing the existence of “attack pheromones” which alert nearby bees to another bee’s distress, and bring out swarms of defensive insects. Bonus fact: a worker bee’s stinger is a modified version of the queen’s ovipositor — perhaps the most explicit weaponization of female reproductive organs in the animal kingdom. Human beings, like most other life that reproduces sexually, all have the same number of chromosomes (ideally). Bees, ants, wasps, and a few other insects operate under a totally different system. You probably know that the queen lays all the eggs, and the drones are there pretty much only to fertilize them, and the workers (all female) are sterile. You might even have heard that the only difference between the queen and her workers is the special food they obtain as larvae. But did you know that the difference between male and female bees is that males only get half the genetic package? Here’s how it works: if an egg is fertilized, it gets 16 chromosomes from the queen who laid it (mom) and 16 from the drone that fertilized it (dad) — and grows up to be female. If it remains unfertilized, it grows up to be male, but a male who received all his genes from his mother. The implications this would have for humans, were they to reproduce the same way, are pretty provocative. Interestingly, this means that while there is some variation among the eggs a queen lays, all of a drone’s sperm are genetically identical — so sister bees are more genetically similar than sisters of most animals. Everything you just read in Fact #6? There are some exceptions. For one thing, some worker bees do reproduce. Typically, these laying worker bees, as they’re known, produce unfertilized eggs, and from that follows that they typically produce only drones. But through a process called thelytokous parthegenesis, a laying worker bee can supply the other half of the required set of chromosomes to create another female bee from other eggs undergoing division. Crazy, right? Not only does apitoxin contain 63 components, including histamines, peptides, sulfuric amino acids, and pheromones, but a bee’s venom sack and the attached muscles often detach along with the stinger, and continue to pump venom and drive the stinger deeper into the unfortunate victim’s flesh for several minutes after the attack. Honeybees are the only genus that loses their stingers when they stings. The various chemicals in apitoxin — bee venom — break down cell walls, cause inflammation, suppress inflammation, cause the production of cortisol, and suppress the normal operation of the nervous system. When death occurs from bee stings in allergic people, it is the result of an anaphalactic shock that closes airways and makes breathing difficult. Death from bee sting in non-allergic people results from multiple stings, usually from “killer” Africanized bees; death typically comes as the result of a similar histamine reaction, but the accumulated bee venom can also damage kidneys and lead to failure, causing death several days after an attack if treatment is not administered in a timely way. The stings of individual Africanized bees are comparable to those of a typical “European” honeybee, but deadly because they are administered by the hundreds or even thousands. Bee sting therapy has been used to relieve the symptoms of arthritis and MS for years, although the scientific literature is admittedly scant. Earlier this year, researchers impregnated nanoparticles with bee venom and unleashed them on HIV viruses. And, well, the HIV died. This is a far cry from curing HIV in a person, of course, but there are a few useful applications for this technique, including ones that would reduce the risks of transmission. Finally, there’s the practice of hymenoptera training (hymenoptera being the order of insects that includes bees, ants, and wasps). And this is exactly what it sounds like: just like a trained dog at an airport, bees can be trained to sniff out things like drugs and disease. Honeybees in Croatia have been trained to sniff out land mines. Unlike a dog, which takes months to train, bees have a simpler brain architecture which allows them to be trained in a matter of hours. If #3 didn’t convince you, try this: take a random number — 100, say. Multiply this by 1.25. You get 125. Easy. Now multiply it by 1.25 again. Then again. Then again. Did you get 244.140625? And get this: the same researcher tried the gambit again, but this time, he released the bees a distance away from the hive — still in view of the hive, but not in view of the food source (now on dry land). Of the 75 bees involved, 73 made it to the hidden food source in under 30 seconds by triangulating their position based on their distance from the hive and a general awareness of their surroundings — a complicated algebra that may include sensing the earth’s magnetic field and the position of the sun. There’s even evidence that bees take the curvature of the earth’s surface into consideration when calculating and communicating paths to different places. Truth be told, we don’t really understand how bees are able to navigate, but it seems that they’re able to perceive landmarks even at a distance, and compare them to a cognitive map inside their minds, much like we do. But while we have something like 85,000,000,000 neurons in our brains, a bee makes do with only 960,000 packed into a space the size of a grain of table salt. That equates to 1,000,000,000,000,000 synapses in the average human, and only about one millionth that figure — a mere billion — for a bee.